Our quality policy is an integral part of our company policy. PMT's actions are based on compliance with regulatory requirements. Our company is committed to the continuous improvement of all operational processes. The responsible employees recognize the customers as the focus of the company's efforts and treat them as such. 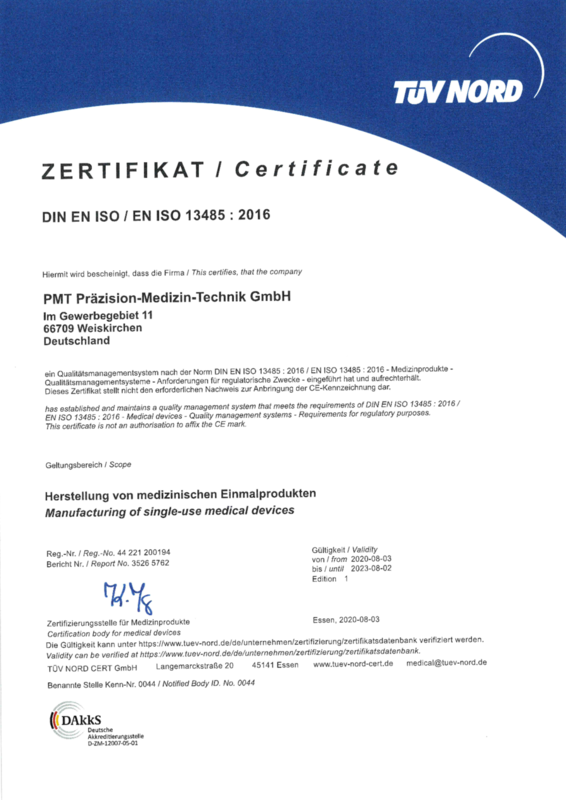 The quality policy of PMT is confirmed by our certification according to DIN EN ISO 13485. The sterilization of medical products is the final step in our production processes. The manufacture of a product and its packing does not lead to a sterile status, despite the best possible conditions, and so these items have to be sterilised after production and packaging. PMT specialises in three main sterilization procedures, some parts of which we carry out ourselves, some of which are under-taken in collaboration with renowned external contract sterilization companies. It goes without saying that all normative requirements are observed in the validation and routine monitoring of our sterilization processes. Of course we also adhere to the requirements and specifications prescribed by current legislation. We will be pleased to select sterilization processes and validations for your products, together with our sterilization partners, in accordance with your product requirements. PMT GmbH meets the requirements of the Medical Devices Act. Our quality management system is certified to DIN EN ISO 13485:2012. Shortly our QM-system will be adapted to DIN EN ISO 13485:2016. Annex I to Certificate "Quality Management System"